Cheese Kofta In Creamy Sauce Or Malai Kofta recipe by Nazia Nazar at PakiRecipes.com. Heat ghee in large pan, cook onions, stirring, until browned lightly. Add garlic , ginger and all spices and cook, stirring, until fragrant. Add tomatoes, nuts and water; boil then immediately simmer, uncovered, for about 20 minutes or until mixture is slightly thickened. Blend or process tomato mixture until pureed. Just before serving, return to pan add cream and salt , stir until just heated through. Combine mashed potatoes, cheese, eggs, flour, coriander leaves , cumin and salt in medium bowl, refrigerate for about 30 minutes or until firm. Shape the rounded tablespoon of mixture into kofta shapes. 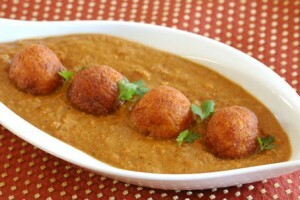 Just before cooking, toss Kofta in corn flour, shake away excess corn flour. Shallow fry in hot oil, in batches, until browned lightly; drain on absorbent paper. Serve immediately with creamy tomato sauce.